At the end of World War II, Chief of Naval Operations, Adm. Chester W. Nimitz, ordered the formation of a flight demonstration team to showcase naval aviation. The team performed its first flight demonstration less than a year later, June 1946. In 1950, the Korean Conflict put a great demand on naval aviation. The Navy responded by reassigning the Blue Angels to the aircraft carrier USS Princeton (CV-37), where the Blue Angels became the nucleus of Fighter Squadron 191 (VF-191). The Blue Angels reorganized in 1951 and reported to NAS Corpus Christi, Texas. The team remained in Corpus Christi until the winter of 1954. In December 1974, the Blue Angels reorganized as the U.S. Navy Flight Demonstration Squadron with Cmdr. Tony Less, as the commanding officer and flight leader. The squadron added support officers and redefined its mission to support Navy recruiting. 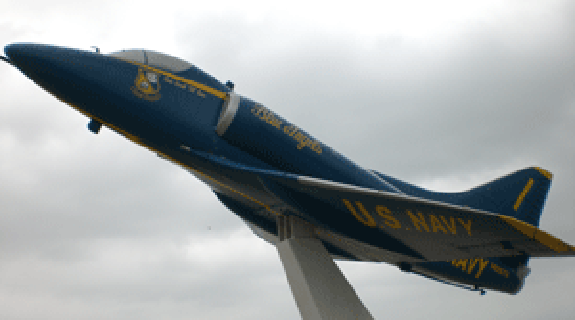 The Blue Angels transitioned to a new aircraft in 1974, the McDonnell Douglas A-4F Skyhawk II, a small but very nimble attack aircraft that had been the backbone of the Navy’s Vietnam efforts. The Skyhawk debuted on May 18, 1974, during an air show at Offutt AFB, Nebraska. Although the Skyhawk was an economical aircraft and its performance allowed the Blue Angels to develop a tight routine that kept the show close to the spectators, fatal accidents in 1978 and 1985 resulted in the acceleration of a transition to the F/A-18 Hornet. More than 15 million people attended Blue Angels air shows during the 2003 show season. Since 1946, the team has had the privilege of performing for more than 380 million people.